Reliance Mutual Fund SIP Insure Plan is available for the investors investing in the designated schemes of the fund house with an add on feature of life insurance cover. Reliance Life Insurance Plan offers free cover of up to Rs 50 Lakh to investors who keep minimum SIP amount of Rs 1,000 with MySIPonline. Although the insurance cover offered by Reliance Mutual Fund is free, there is a cost associated by way of exit load on early redemption. Reliance SIP Insure is a facility for the investors who have opted for SIP investments in Reliance Mutual Funds. It is an insurance cover that is provided free of cost in the form of a group term insurance to the individual investors on selected schemes. It encourages an investor to invest and remain invested via SIP to achieve their financial goals. Let’s have a detailed overview of the Reliance insurance plans. What Are the Benefits of Reliance Insurance Plans? The main idea behind this addition of insurance to SIP is to help investors remain focused on their investment and in case of their death, the long-term objective should still be achieved. 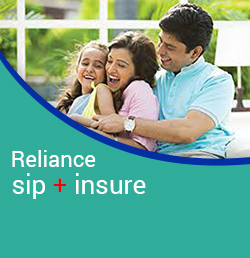 There are a number of benefits attached to reliance sip insurance plans online investment which you will get to read in the following points. SIP Investment : Since this is an SIP investment, there are a number of benefits attached to it in the form of rupee-cost averaging, compounding benefit, habit of disciplined investment, etc. There is no need to time the market to invest in reliance insurance plans. Free Life Insurance : The life insurance cover which is provided is actually free of cost as the premium is payed by the AMC itself. An investor may avail a cover worth Rs. 50,00,000 as the maximum limit. Freedom to Choose : Reliance SIP insurance plans facility is applicable on 18 schemes of Reliance Mutual Fund which means that an investor has the freedom to choose the right scheme as per their portfolio requirement. Long-term Investment : SIP investment yields the best returns in a long-term period as a result of compounding benefit and added insurance encourages an investor to remain invested. Thus, leading to a long-term term goal fulfillment with the best returns. Reliance SIP Insure Plans : Who Is Eligible to Invest? There is a certain eligibility criteria which should be fulfilled in order to enjoy free life insurance cover which is mentioned in the points below. All investors who are investing in the designated schemes via SIP and opting for “Reliance Insurance plans”. Individuals whose age is 18 years or more and less than 51 years is eligible to avail it. If there are multiple holders of a particular scheme, then only the first holder will be eligible for the insurance cover. The minimum SIP investment amount per installment should be as follows: monthly installment of Rs. 500, quarterly installment of Rs. 1500, and yearly installment of Rs. 6000. There is no maximum investment limit. The minimum time period for which the installments should be deposited is 3 years. The investor will cease to get the benefit of insurance cover once the investment reaches maturity or the age of 55 years is attained by the investor. It is compulsory for an investor to complete at least three years of investment, inability to do the same in the form of discontinuation of installments will exempt him from availing the insurance cover. Partial or full redemption before the completion of the investment tenure or the attainment of age of 55 years will disable the insurance. The last reason because of which insurance cover cessation may occur is the default in payment of three installments continuously or five installments over the period of investment or till attainment of 55 years of age, whichever is earlier. In case of death due to suicide, or within 45 days (excluding death by accident) of commencement of SIP installments, the person’s family won’t be eligible to receive the insurance amount. Below mentioned are some of the top performing schemes in which you may invest through SIP and at the same time avail the life insurance cover. Reliance Small Cap Fund (G) : This fund mainly invests in the equity and equity related instruments of small cap companies to help investors earn long-term capital growth. These funds are for aggressive investors as the risk involved in it is high but so are the chances of return. Reliance Equity Hybrid Fund (G) : This is an open-ended scheme which mainly invests in equity and equity-related instruments with a portion of assets inclined towards debt and money market instruments. An aggressive investor who wishes to earn long-term capital appreciation may invest in this scheme. Reliance Large Cap Fund (G) : This fund mainly invests in the equity and equity related instruments of large-cap companies which are the top 100 companies in terms of the market capitalization. The returns that they provide are comparatively stable compared to the small cap funds, as the top companies are well-established. Investors who can bear high risk may invest in this scheme by Reliance MF. These were the major points about Reliance Insurance plan and the top schemes in which you may invest. If you are fond of investment in schemes through SIP, then you should opt for the insurance linked SIP investments as they are a smarter choice in the current scenario. Please make sure that you understand your portfolio’s requirement well and have proper understanding regarding the scheme’s performance and the growth scope. In case you have any confusion or doubt related to any of the aspects of these insurance linked schemes, feel free to consult the financial experts at MySIPonline. If you have understood or already shortlisted the scheme by now, start investing online in Reliance SIP Insurance, as the sooner the better. Reliance Insurance Plan was a pleasant surprise for me when I came to know about them for the first time. It is a good investment option for all those who invest in the mutual fund schemes via SIP mode. Now I no more have to worry about the additional premium that I had to incur earlier for life insurance. My financial burden has decreased and so has my tension. Investing in these funds via mysiponline only became an add-on delight.